Billy Leroy is meeting with his landlord tomorrow to start planning a huge farewell party before he moves his tented antique shop on the Bowery indoors. The last hurrah, he said, would come at the end of January. “We’re planning a week-long event of music, poetry, singers, songwriters, and films. There’s going to be a huge lineup. It’s the end of the old Bowery,” Mr. Leroy told The Local today. 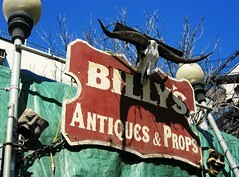 Billy’s Antiques and Props is moving inside a two-story building its landlord, Tony Goldman, is erecting on the spot in late winter. “There’s no one left from the old Bowery days. It’s been yuppified,” he said.